The Spitzkoppe, meaning 'pointed dome' in German, is a magnificent array of bald granite peaks that rise up dramatically from the relatively flat desert plains of the Namib Desert. While one of Namibia's lesser known attractions, these spectacular rocky domes are a rock climbers and hikers paradise. With the highest peak rising 1784 metres (5,853 ft) above sea level and towering 700 meters (2300 feet) above the desert floor below, it is a Namibian landmark worth a visit. 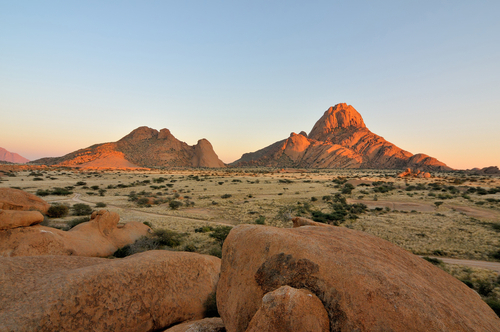 The Spitzkoppe, also known as Spitzkop or the 'Matterhorn of Namibia', is located 180 kilometers (approximately 112 miles) from Swakopmund, and 280 kilometers (approx 174 miles) from the nearest airport at Windhoek. While the Spitzkoppe may be a bit off the beaten track, the drive is well worth it as the scenery is not only unique and other-worldly, but breathtakingly beautiful. Guided day trips are offered from Swakopmund and Walvis Bay, and for those wishing to spend a few days exploring the granite outcrops, there are secluded campsites dotted around the base. If roughing it is not your style and you would prefer accommodation with a bit more luxury, there is also the Spitzkoppe Mountain Tented Camp or the more upmarket Spitzkoppen Lodge nearby. The Spitzkoppe also has a rich archeological history, with at least 37 sites containing Bushman rock art, some of which are 4000 years old. Archeological excavations in the area have revealed stone artifacts used as weapons for hunting or preparing animal skins. 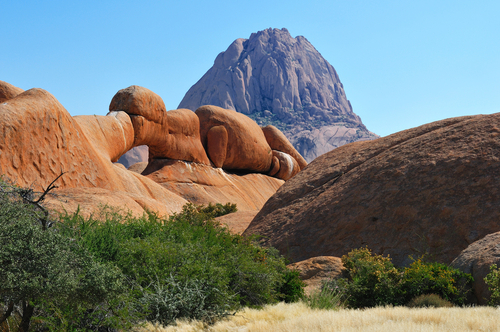 It is believed that the Spitzkoppe was used as a base by Bushman during the dry season due to its reliable food and water supply. One needs to book a guided tour with a local guide to visit these sites, as access is restricted due to their extreme vulnerability. If you are a keen hiker, rock climber or star gazer, a road trip to Spitzkoppe will not disappoint. As one of Namibia's more remote and unspoilt locations, it's a great place to get close to nature without all the commercial frills typically found at some of the country's more popular tourism hotspots. It's also not as crowded, so offers a true wilderness experience for those looking to get away from it all.